Kerala PSC exam calendar November 2014 has been published in the official website of Kerala PSC. Kerala PSC exam timetable and schedule for November 2014 available in PDF format can be downloaded from the PSC website for further reference. Candidates who are appearing for the exam can visit Kerala PCS official website (www.keralapsc.gov.in/) for more information. 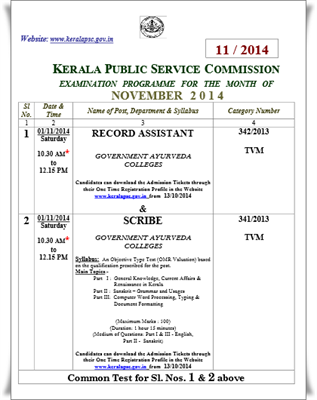 The Kerala Public Service Commission (Kerala PSC) has published the exam calendar for November 2014 at the official website. The Kerala PSC exam timetable and schedule for November 2014 is now available in PDF format which can be downloaded from the Kerala PSC website (www.keralapsc.gov.in) for further reference. 26 exams will be conducted in the month of October 2014 including the Last Grade Servant exam in various districts. Here are the names of 10 important exams, while the complete list and details of the exams can be downloaded as PDF format from the official web portal of the Kerala PSC. The exam calendar is well prepared in a manner to give an insight to the candidates about various exams including its timing, syllabus and also date of downloading the hall tickets. Candidates who are appearing for the exam in November are advised to download the exam calendar along with exam syllabus to have a thorough knowledge about the exam and question pattern. Candidates who have applied for the any of the exam which is being scheduled to conduct in November according to the Kerala PSC October exam calendar must follow the instructions as given in the schedule. As the date of downloading the exam is given in the exam calendar, candidates need to follow the instructions as mentioned in the PSC website. The preliminarily test consists of an objective type exam (OMR Valuation) based on the qualification prescribed for the post will be conducted at various exam centres. General reading along with the technical knowledge according to the syllabus is needed to score high marks in the exam. From the experience of the top scores, a systematic learning strategy has worked well during the final preparation of the exam. Candidates must remember the following key points while preparing for the exam. Apart from the Main Topics mentioned in the Syllabus or program of study as referred to in the exam calendar, questions related to the educational qualifications might also appear in the question paper. Candidates should produce the Identification Certificate attached to the admission tickets along with the original of prescribed documents to prove their identity during the time of examination. Failure in producing the original identity proof might result in not permitting to attend the exam. Kerala PSC exam calendar July 2014 has been published in the official website of Kerala PSC. Kerala PSC exam timetable and schedule for July 2014 in PDF format can be downloaded and use for further reference. Complete details about various exams, syllabus and hall ticket details are also mentioned here. Candidates can visit Kerala PCS official website (http://www.keralapsc.gov.in/) for additional information. Kerala PSC exam calendar August 2014 has been published in the official website of Kerala PSC. Kerala PSC exam timetable and schedule for August 2014 in PDF format can be downloaded from the PSC website for further reference. Candidates can visit Kerala PCS official website (http://www.keralapsc.gov.in/) for additional information. Kerala PSC exam calendar September 2014 has been published in the official website of Kerala PSC. Kerala PSC exam timetable and schedule for September 2014 in PDF format can be downloaded from the PSC website for further reference. Candidates can visit Kerala PCS official website (www.keralapsc.gov.in/) for additional information. Kerala PSC exam calendar October 2014 has been published in the official website of Kerala PSC. Kerala PSC exam timetable and schedule for September 2014 available in PDF format can be downloaded from the PSC website for further reference. Candidates who are appearing for the exam can visit Kerala PCS official website (www.keralapsc.gov.in/) for additional information. Kerala PSC exam calendar December 2014 has been published at the official website of Kerala Public Service Commission. The Kerala PSC exam timetable and schedule for December 2014 is currently available in PDF format which can be downloaded from the PSC website for further reference. Candidates appearing for the exam scheduled for December 2014 can visit Kerala PCS official website (www.keralapsc.gov.in/) to gather more information.